The Big Brand Water Filter, Inc. Accumulator tank is a bladder type pressure storage vessel and/or pulsation dampening device designed to hold water under pressure. The accumulator tank provides additional water storage to assist the pump in meeting the total demands of the system. 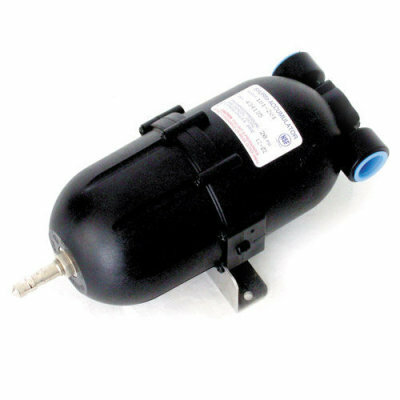 It extends pump life by eliminating pump pulsating on/off. Makes water available at a moments notice w/o cycling the pump. The standard accumulator is pre-charged to 20 psi [1.4 bar] at the factory for ground shipment. Do not exceed this pressure for long-term storage, shipping, or during system non-use. Accumulators with more than 40 psi [2.7 bar] pre-charge and no liquid pressure may damage the bladder. The accumulator prevents pump cycling when using a fixed speed delivery pump. Accumulator Tanks available provide total control of a wide range of water pressure problems, in a wide range of applications. Some water filter systems, instant hot systems and refridgerator dispensors internally regulate flow. This will cause higher flow delivery pumps like the 1.2 gpm model to cycle on/off repeatedly. Adding a delivery pump accumulator tank will prevent the rapid cycling of the pump. The Big Brand Water Filter, Inc. Accumulator tank is a bladder type pressure storagevessel and/or pulsation dampening device designed to hold waterunder pressure. The accumulator tank provides additional water storage to assistthe pump in meeting the total demands of the system. It extendspump life by eliminating pump pulsating on/off. Makes wateravailable at a moments notice w/o cycling the pump. It is recommended the pre-charge be checked on a monthly basis. Use a standard tire pressuregauge to check the pressure. The pre-charge valve stem cap MUST be tight to prevent air leakage. The accumulator may be placed anywhere in the pressurized side of the plumbing. The ports are non-directional in flow and do not have to be plumbed in line (one side can be plugged). Can be mounted in any position. However, for complete sanitizing/winterizing, the recommended mounting position is with pre-charge valve stem up. Do not freeze or mount near a high heat source. Models with 1/2-14 ports: Insert the rubber washers in each port. Threaded fittings (plastic/nylon only) should be torqued approximately 1/2 to 1 turn after hand-tightened. Never exceed 6 ft/lbs [88 Nm] of torque on the ports. Plumb the system using high pressure (2x pump rating), braided, flexible tubing to minimize vibration/noise. The accumulator contributes to longer pump life, less noise, less amperage draw, and reduced water pulsation. The most efficient use of the accumulator occurs with the pre-charge set at the SAME pressure as the pump s pressure switch turn on setting. Typically, a 40 psi [2.7 bar] pump will turn on at 20 psi [1.4 bar]. Therefore, the pre-charge should also be 20 psi [1.4 bar]. The pre-charge MUST be set in a static condition (pump off and at least one water fixture opened). Approximately 15% of the total volume will be stored liquid. Depending on pre-charge pressure to the accumulator, in relation to the pump turn on/off pressures, stored liquid is about 2 to 4 oz. [60-120 ml]. If accumulator tank pre-charge exceeds pump turn on pressure, the liquid volume is reduced. For applications requiring an intermittent flow rate at a given pressure, the proper pre-charge is the minimum pressure required at the dispense valve. For example, if a system requires a minimum pressure of 30 psi [2.0 bar] (for correct brix, etc. ), the pre-charge should be set at 30 psi [2.0 bar] to permit the most reserve storage capacity. When used as a dampening device/water hammer or noise suppressor, the pre-charge should be set at the operating (dynamic) pressure. Place a gauge in the offending plumbing where the accumulator can be mounted. Adjust the valve so the noise is generated and read the pressure. Set the pre-charge to the observed pressure, remove the gauge, and install the accumulator.Refer to Big Brand Water Filter, Inc. Service Bulletin #1024 for application information.